WE visited Caernarfon in the spring to see the gift shop that used to be my grandfathers antiques shop (The Regent Antique Company), and couldn’t go there without taking photos of Caernarfon Castle too. 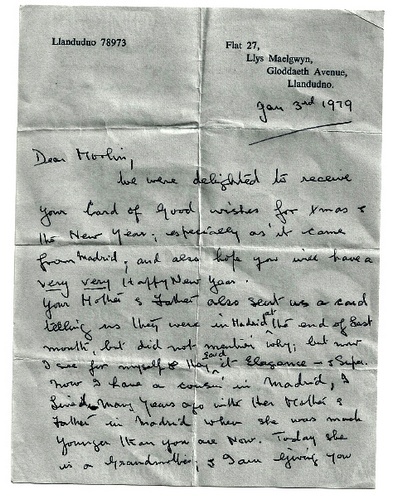 Just last month, Morlin sent me (and my father of course) a copy of a letter she received while working in Madrid in 1979. It was from my grandfather, William Harris, in Caernarfon, Wales. 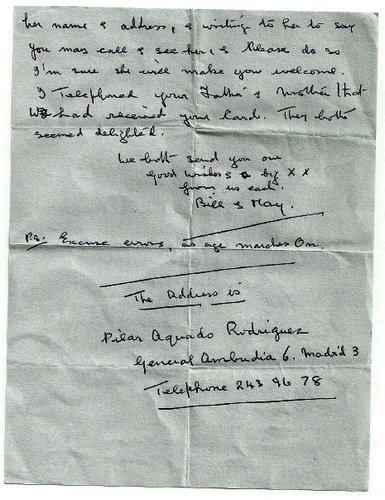 Although this letter has always been personal to her, she says it is history and evidence of Bill’s Spanish family names and their addresses, so she is more than happy for me to show it here on this website. I read this letter as soon as Morlin sent it to me and I came out in goose bumps straight away. And for the first time since beginning my research (and these websites a year ago), I began to feel I was starting to know the man my father never really knew. This letter made my grandfather a real person. It shows he had character, kindness and also a sense of humor.